Made up of several muscles and tendons, your rotator cuffs connect your upper arm bones to your shoulder blades. Occasionally, the muscles or tendons of the rotator cuff become irritated or damaged as a result of injury or overuse. After a few days of rest, gentle exercises can help rehabilitate the rotator cuff and strengthen the shoulder. Performing these rotator cuff exercises in a swimming pool allows for an effective workout without placing unnecessary stress on the cuff. In April 2000, the "Journal of Orthopaedic and Sports Physical Therapy" published the results of a study that compared the effects of land and water exercises on the rotator cuff. Researchers found that muscles were activated significantly less during the water exercises. While the water's buoyancy minimizes the amount of stress placed on the rotator cuff, the resistance created by the water actually improved the effectiveness of the exercises. 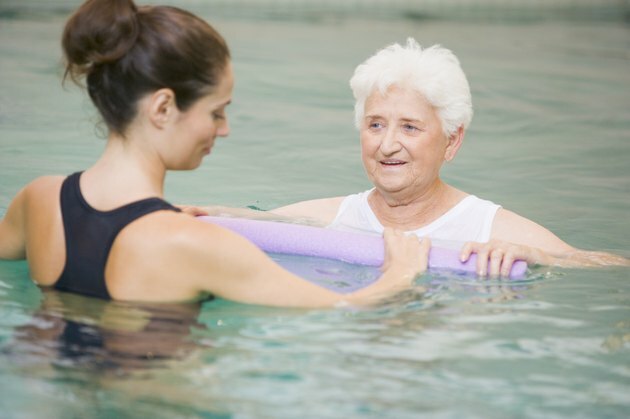 The study concluded that aquatic therapy allows for earlier rehabilitation after rotator cuff surgery or injury without compromising the patient's safety. Begin aquatic therapy standing in shoulder-deep water. Gently swing your arms in clockwise and counterclockwise directions to warm up the muscles. Stand straight with your arms resting at your sides. Keeping your elbow straight, slowly raise your arms at a 30-degree angle to the front of the body. Continue lifting until your hands are almost at shoulder height. Repeat 10 times with each arm. Still in a standing position, bend your elbows to a 90-degree angle and keep your arms near the sides of your body. In this position, your forearms should be parallel with the pool floor and thumbs should be pointing up. Keeping the 90-degree angle at the elbow, move your hands away from your body until you feel a stretch in the rotator cuff. Hold for 30 seconds before returning to the starting position. Repeat five times with each arm. The repetitive overhead strokes used in swimming are one of the most common causes of rotator cuff injury, according to Shoulder Pain Management. Since this overhead motion can further irritate the injury, involve these types of movements while exercising in the swimming pool. If possible, focus on water aerobics exercises rather than traditional swimming strokes. Additionally, avoid exercises that require you to throw a ball or move your arms overhead repeatedly. When the rotator cuff is weak or injured, it typically causes significant pain, tenderness and weakness in the shoulder. These symptoms often become more severe when you reach your arms overhead or behind your back. To ensure safety, use a flotation device while exercising in the pool. However, avoid grasping onto a buoyancy barbell, as this could further irritate your rotator cuff injury. Instead, wear a flotation belt or grasp a buoyancy noodle between your legs. Is Swimming a Full-Body Workout?